Mike Jakuba was still a year away from being born when scientists found vents on the seafloor that gushed hot, mineral-rich fluids and were surrounded by bizarre life forms thriving in the absence of sunlight. Ever since that landmark discovery in 1977, these so-called hydrothermal vents have become holy grails for geologists, chemists, and biologists. Vent sites hold clues to the formation of Earth’s crust, the chemistry of seawater, the development of huge mineral deposits, and the evolution of life. No two vent sites are alike, and for three decades, scientists have been on a global quest to locate more. But it’s a wide, deep, dark ocean out there, with no signs pointing the way to the vents at the bottom. Some scientists, of course, are experienced vent hunters and know the signals to look for, but they can’t actually follow the trail under water. 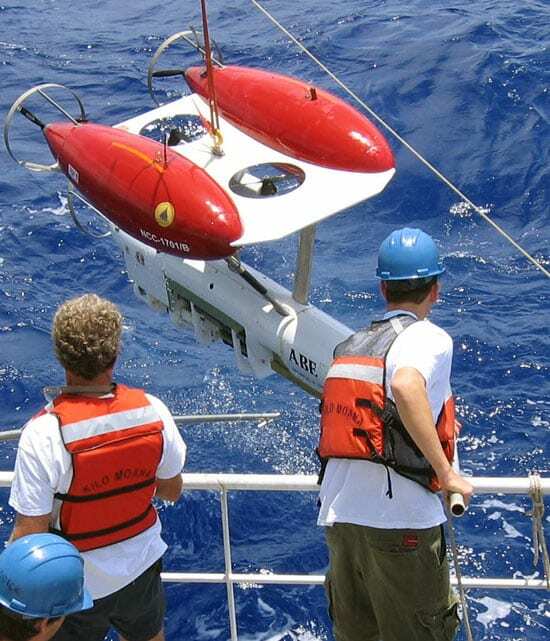 Their mission has been greatly aided in recent years by the Autonomous Benthic Explorer, a revolutionary deep-diving vehicle affectionately known as “ABE.” It acts like a deep-diving robotic bloodhound, sniffing whispers of clues that might lead to vents: mere fractions of a degree of changes in water temperatures, for example, or barely measurable chemical signatures. “ABE has been remarkably reliable,” said Jakuba, who has worked with ABE and vent-hunting scientists in pursuit of his Ph.D. degree from the MIT/WHOI Joint Program. But ABE’s autonomy was limited: Between dives, it relied on input from scientists to tell it where to go next. If it only had a brain … well, a smarter one that could interpret the clues its sensors are detecting, “think” like a scientist, and reprogram itself on the fly to pursue a vent trail without receiving further instructions. That has been Jakuba’s mission over the past six years. Jakuba, whose parents emigrated from Czechoslovakia and whose first language was Czech, created sophisticated computer algorithms to enhance ABE’s IQ. 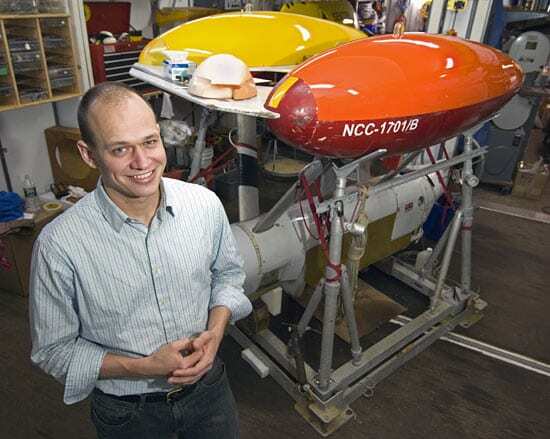 His success marks a significant stepping-stone in the effort to get robots to facilitate the work of ocean scientists. Vents are often found along volcanic mid-ocean ridges, which zigzag down the middle of every ocean basin like a giant zipper. At the ridges, Earth’s crust spreads apart, allowing magma from the mantle to come up and form new crust. The geothermal heat catalyzes fascinating chemical reactions between crustal rocks and seawater percolating down into them. This chemistry produces vast seafloor mineral deposits, as well as hot, buoyant, mineral-rich hydrothermal fluids that spew from seafloor vents. These fluids sustain rich communities of unusual life forms that thrive via chemosynthesis, rather than photosynthesis. Traditionally, scientists have hunted down vent sites by first locating “vent plumes.” Picture a huge, billowing cloud of smoke rising high in the sky from a tiny campfire; like a genie coming out of a tiny bottle, the plume grows mammoth and obscures its source. Now imagine you are in a helicopter hovering two miles above the smoky cloud, on a moonless night, and you have to find the campfire. In the deep ocean, of course, you cannot physically see the vent plume in pitch-black waters roughly two miles below. The plume is finicky, too: It sloshes back and forth with the tides and mixes and eventually becomes diluted in surrounding water. In the past, scientists have relied on detecting signs of a vent plume by towing a cylindrical instrument called a CTD on a wire line behind a ship. The CTDs go up and down in the water column in a sawtooth pattern and collect plume data, but they consume a lot of valuable ship time and cannot accomplish all that ABE can. In the big ocean, it’s much easier to miss than find a vent plume. German recalled one vent site that took two cruises over more than a year to find. ABE’s modus operandi makes vent-hunting more effective and efficient and saves scientists time and energy. 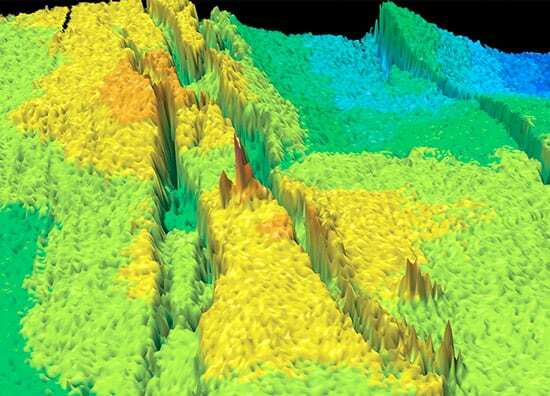 It can survey a good piece of seafloor territory, and it speeds up the vent-finding process by performing a three-phased dive cycle based on input from its programmers. In a progressive series of three dives, it first swims on its own about 250 meters above a suspected vent area, up and back in a lawnmower-like pattern, surveying the seafloor and collecting water chemistry and temperature data. Depending on what ABE collected, scientists can program ABE on its next dive to home in on suspected vent sites and survey at 50 meters above the bottom to gather sonar data for high-resolution maps of the seafloor that might indicate hydrothermal vent structures. If it finds something, ABE can them be programmed to dive to suspected targets just a few meters above the bottom to capture images of the vent structures themselves. A truly autonomous underwater vehicle, however, would be able to make decisions “on the fly,” German explained. It would stay submerged for a few days a time, swim on its own, “sniff” the water for hydrothermal plumes, and “decide” where to go next, based on the data it collects along the way. If it senses a plume, it would “know” to dive down just a few meters above the vent to take photographs, and then carry on with its mission. Jakuba is quick to point out that ABE is a far cry from his definition of a “smart vehicle,” but making this AUV do a better job of living up to its namesake as an autonomous underwater vehicle was a perfect challenge for Jakuba, whose shy grin belies his intellectual grit. A glance at Jakuba’s resume reflects his extensive academic training in mechanical engineering, yet his dissertation required more computer than mechanical engineering work. Jakuba’s sharp programming skills were developed and honed by his determination on the job, in the lab and on the five major research cruises in which he has participated with ABE. On an expedition in the South Pacific in 2004, Jakuba transformed German’s “hunches” on where vents might be into bits and bytes of a computer program that instructed ABE where to go and what to do. “When ABE followed Mike’s program, it returned on its own to the area that I thought was most important to explore,” German said. So in its first trial, ABE already accomplished in one dive what it normally did in two. “Seeing this process is weird,” German said. “At one level, having a machine designed to emulate your own brain is very ego-massaging and flattering. At another level, if a machine can be trained to do it in under a month, maybe what you’re famous for isn’t all that special after all. Very disturbing,” he said cheekily. Bye bye, ABE. Hello, Nereus. When not hot on the plume of a new vent site, Jakuba has done his share of tinkering in his “spare time” during his WHOI tenure. One of his favorite ventures was rebuilding a fiberglass lobster boat with his friends. “We even got the curve of the transom just right,” he said with the pride of an engineer who knows such things are important. The punchline? “I really don’t know anything about boats,” he said. With his Ph.D. degree awarded in February 2007, Jakuba is hot on the trail of what will come next. In the spring, he will marry Rachel Wisniewski, a MIT/WHOI Joint Program student whom he met more than five years ago and who also graduated last year. The two will head south to Washington, D.C.
“I will miss ABE,” Jakuba said. But he has already found a new robotic fling—one that has also has a WHOI lineage, and one that will allow him to get his hands dirty rather than just his keyboard. He starts a postdoctoral fellowship at Johns Hopkins University on Feb. 20. 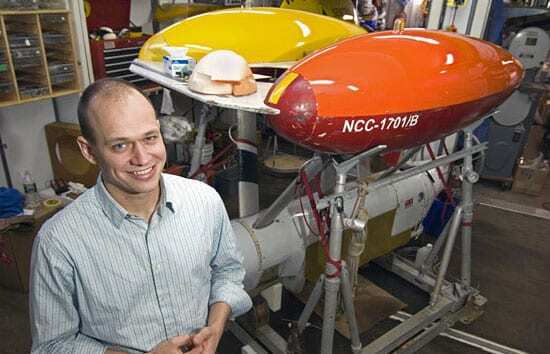 He will work with Louis Whitcomb, an engineering professor who runs Johns Hopkins’ Dynamical Systems and Control Laboratory, on a collaborative project with Yoerger and the WHOI Deep Submergence Laboratory to build Nereus, a unique hybrid vehicle that can act as both a tethered robot and an autonomous underwater vehicle.